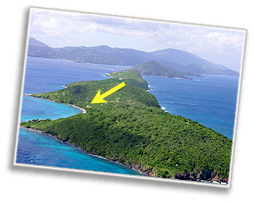 This 118 acre island, 1.5 miles north of Cruz Bay, St John is home to only three full time residents, who are jokingly called Lovangolians. Years ago, in the mid 1800s, there were over 50 people living on Lovango where fishing was the industry of choice. It is not surprising with the deepwater anchorage on the south side, sailing vessels would have easily made anchorage here. There are no utility lines from St John to Lovango. Most of the homes have solar and wind power to generate their own electrical power, which is stored in batteries then transformed into regular 120-volt a/c current. Island wildlife includes numerous bird species and strangely enough, goats. The goats that you may see around the north side of Lovango are wild goats now, descendants of the goats left from earlier settlers.